You don’t need the best food processors to cook, but you would definitely want one. This is even more accurate with home cooks. We home cooks aren’t professionals. Meaning, it is going to take us quite a while to be in the kitchen for a meal. We cook for different reasons, some cook to save money, some to enjoy themselves, etc. and it would be so much nicer to shorten down some processes, saving us time for other things. That’s why we’re here together, looking at possible choices, exploring our options, like all smart consumers prior to a purchase, for a best-friend-to-be on our countertop. We here at Luna’s dare say this: you’ll find what you need here; or at least, you will be much more equipped to choose a good food processor. We will be discussing, first about the appliance at different sizes, which is best for which purpose, and second about the best models on the market right now in 2019. If you find this article helpful in any way, please drop a comment to let us know. We’d really appreciate that. That depends. In occasions of family gatherings or parties, it’d be better to make something ‘heavy’ in one go. Therefore, a large machine with multiple functions and a big work bowl would be perfect. Other times, we only need help with simple tasks like chopping vegetables or making dressings for the final touch, which makes mini choppers a fine choice. Knowing our needs will help us pick up the most fitting machine and prevent our resources from being wasted. Large food processors refer to units with a large work bowl, usually from 12 to 14 cups. They are paired with a stronger motor and larger feed tubes compared to smaller units. Large work bowls allow for the easy making of big portioned salad or coleslaw, perfect for occasions such as parties or family gatherings. Besides a standard chopping/ mixing/ grinding blade, they also come with a couple of discs to help us slice and shred our veggies, fruities, cheese and many more. Usually ranging from 8 to 11 cups of capacity, medium food processors are, at their basics, minimized large ones. They have all the functions of a large processor, just with a smaller work bowl and motor. If most of your cooking is for one or two people, medium size should be a wonderful choice. Small food processors are commonly known as mini choppers because of their main functions. With a small work bowl (under 7 cups, no feed tubes) and a chopping/ mixing blade, they can aid in simple prepping tasks: pureeing, grinding nuts or dried fruits, cutting up garlic, onions…, and kneading dough, if the need arises. Shredding and slicing discs will not be included in the package as these machines are not designed for such tasks. The mini chopper can also be used to make mayonnaise, vinaigrette or mustard with minimal efforts. What Are The Best Food Processor Brands? There are a lot of companies that make food processors. Frankly, without decent research, one can easily get confused and mistakenly choose the wrong brand to commit. Therefore, in order to prevent that and to save you all some time, here are the most favorable companies in recent years. Talking about food processors, Cuisinart is usually the name that will come up sooner or later. Why? Because it is the oldest food processor brand in the US, as the first unit was introduced into the land by the late founder of the company – Carl Sontheimer. With experience and efforts, the quality of Cuisinart products has been tested over the years. There’s little doubt that the company produces mostly, if not exclusively, excellent machines. Another top-tier manufacturer is Breville. Renown for their high-end products with technologies that capture the love of home cook, the company logo is not a strange sight to be found in kitchens everywhere. Breville is a major global brand of home appliances. Targeting a very specific group of consumers, their collection of food processor consists only of sophisticated and expensive units, albeit very limited in the number of models. Like Cuisinart, Ninja ® is a company “born and raised” on the U.S soil. Carrying the pride of the nation, the company aims to dazzle the scene with innovative thinking in their products. And similar to Breville, Ninja specializes themselves in developing products for busy people. It can be seen in the way they design their food processors: effective to multitask and easy to use. Hamilton Beach food processors are practically everywhere judging by how much — and how well — users have been reacting to them. They’re cheap, convenient and fairly efficient. There are not much more to ask from a budget-friendly brand. The brand is not necessary untouched by negative feedback, but such is the way the company functions. They build machines for particular uses in a particular context, not for a universal purpose. Now, it’s time for the best food processor review. Below is a preview of those we find to be the most worth-buying units on the whole market base. Looking for a large model of food processors, one simply must take at least one glance at the Cuisinart Custom ™ series in the sea of models out there. The Custom ™ DFP-14BCNY is one of the most successful models and can well be deemed as the best unit for the money, if not the best rated food processor. With a work bowl of 14 cups, brushed stainless steel discs/ blade and quality build, this particular unit is a necessary, mid-priced consideration. First available in 2016, the unit is positively (at the time of writing) among the top 5 bestselling food processors on the current market. Let’s take a look at this apparently awesome unit. Despite being launched in the time of modern designs, DFP-14BCNY instead highlights values of similarity and simplicity. Without touchpads or multiple speeds that have been featured in plenty of models from different brands, the unit adopts paddles control. These paddles offer a traditional vibe with physical impact and clicking sounds when the gears are locked in. There are two paddles: ON and OFF/Pulse. The work bowl is 14 cups large, which is great for production of big servings, and of course, not without Cuisinart safety feature where the machine operates only after the lid/ pusher is locked properly. The docking is pretty standard as the bowl locks into the motor with a simple counterclockwise turn. The lid uses the same mechanics, locking/unlocking when twisted on. Regarding the feed chute, the product offers two feeding options: one extra large feed tube plus large pusher for big, round veggies and fruits, and one smaller tube for smaller produce. The small tube also has a small pusher, which has a drip hole for liquid/oil to go through. 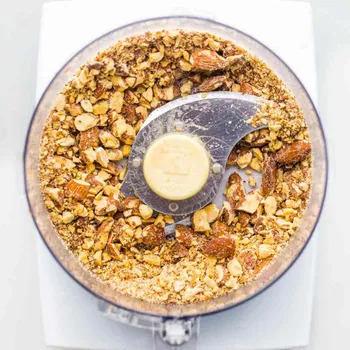 DFP-14BCNY, like any other food processor, comes with a stainless steel S blade for general uses: pureeing, chopping vegetables, mixing/kneading dough, and grinding nuts, seeds or dried fruits. In association with a 720-watt motor, this blade is empowered immensely, cutting up even thickest amount of vegetables with no hardship. Beside the blade, a pair of stainless steel slicing (4mm) and shredding discs are also included. With a few tricks, the unit will forever change how you feel about lengthy prep tasks, slicing cabbage for example. Considering the fact that the DFP-14BCNY is quite a thick machine, it is surprising that it usually takes me less than a minute to take the unit all apart to clean. The design is complex yet not complicated. There are three main parts that frame the machine: the motor, discs/ blade, and the work bowl/ lid, in which the assembling/ disassembling of the lid requires some getting-used-to. Safety tips: 1) always remove the work bowl from the motor base before removing the blade. 2) remove the blade before tilting work bowl or hold it down with a spoon or spatula to prevent it from falling out. 3) if the sleeve gets detached from the pusher, do not use the machine. Call for consumer service at once. The stem that goes along with the discs also has a little learning curve to get it attached right. We have to look for where the cue symbol and the locking switch are on the stem, and which way to twist it. Tip: always place the discs on a flat surface before attempting to connect the stem. It’s truly not as complicated as it sounds. Once you’ve seen how the part works, it won’t be a problem anymore. Now, regarding cleaning, it’s worth mentioning that all the parts (except for the motor) are dishwasher-friendly like your typical kitchenware. And it’s also worth noting that due to the number of the unit’s components, things will get mildly frustrating if you DON’T have a dishwasher. The pusher seems to be the usual place of lodging. We should rinse it right after use so the remains don’t dry off. Otherwise, it’s not that bad.. The thing to really be concerned about, as always, is the blades and discs. Most of the people who’ve had experience with food processors will tell you to be mindful around them. Learning where to hold them and what to clean them with can save you some blood. At this price, it is reasonable to expect a quality motor, not just with strength, but with stability as well, especially from Cuisinart. Living up to the reputation, the company associates their product with a 720 W (~1 HP) motor to face up our kitchen demands with force. The Cuisinart Custom ™ DFP-14BCNY doesn’t really mind heavy work and it is one of the best machines to be making nut butter, but it is always advised not to strain our processor units. The model is covered with a full 5-year motor warranty and a 3-year Limited warranty on entire unit. The Cuisinart Custom ™ DFP-14BCNY is a well-rounded machine at under $200. Offering not only high-end construction, reliable performance but also features to keep the owners and the unit off harm’s way. The only potential weakness of the model is the complex lock-to-operate system, which has been negatively reviewed from a small number of users. Other than that, it is a total must buy in large bowl category. If you’re interested in Cuisinart, our Cuisinart food processor review is probably a good read for you. Have a look! The Hamilton Beach 70740 is one of the cheapest 8 cup food processors out there. There isn’t a doubt that this machine right here is the best budget pick for 2019. On first look and touch, the machine is built with cheap plastic and does not feel sturdy. However, it proves to stand the test of time if not used heavily, which is superb for such a low cost item. Still, slicing will seem a bit off as the slices will most likely come out uneven. But considering the fact that it’s the same price as a standard mini chopper, it definitely makes a decent purchase. Grinding and crushing ice are not recommended by the manufacturer. Control of the Hamilton Beach 70740 is in shape of a knob, offering two spinning speeds and one pulse option. And that’s pretty much it. When turning the knob counterclockwise, we can access the two speed options, keeping the machine running continuously if not turned back to 0. Turn it clockwise and the machine will pulse. Note: make sure you’ve unplugged the unit or twisted the knob back to the ‘0’ position before removing the lid to prevent accidents. The work bowl is relatively fair. There’s nothing about it to be complained or praised. It’s 8 cups of capacity, has one handle and one lid with feed tube and pusher. Though, you may find the feed tube a bit smaller than expected. Slicing round vegetables or fruits will be a challenge. But with long-shaped ingredients like cucumber, carrot or a block of cheese, you won’t be having many problems. Additionally, the pusher also has two holes to let liquid pour through during the process of dough kneading or making salad dressing. Hamilton Beach 70740 model features a pair of stainless steel S blade and slicing/shredding disc. The blade is standard, used for chopping and pureeing various ingredients from soft to medium hard texture. The disc, on the other hand, is quite interesting. It is a double sided reversible disc, which is a slicing disc on one side and a shredding disc when flipped to the other side. You can easily tell which is which since there engravings on both sides of the disc. The one thing that many don’t like about the design of the discs is the inconveniently small top hub. It is quite hard to get a hold of, especially when it’s wet. This model of Hamilton Beach food processor is designed to be compact. One motor, one cup/lid, and blade/disc are the entire package. Mechanics is standard. Twist and turn to lock/ unlock the work bowl/ lid; blade/ disc needs only lifting and dropping to be in place for work. You can’t get less work than that. Safety tips: 1) never place the blade/disc without the work bowl properly in place. 2) make sure the lid is secure before operating. If you don’t have a dishwasher, cleaning is possibly annoying — and could be risky. The blades and discs are razor sharp and can cut your hand quite smoothly. So cautiously clean them with sponges on the sink’s counter, where you have full sight of the things instead of in the sink where bubbles can hide them. On the other hand, if you DO have a dishwasher then all things are blessed because the bowl, lids, blades, and discs are dishwasher safe (though not SANI safe). But that’s not the best part. The best part is most of the components (except the motor) can be put inside the work bowl, taking less space in your cabinets. A little notice: watch your hands around the blade/ discs. As you switch between them or put them in/ get them out of your dishwasher, always hold the discs by their edges and the blade by its tip handle. They are nail-cutting, razor sharp. There‘s no need to argue about how impressive it is to have a 450 W motor for just roughly $30. However, as you have well noticed, there’s rarely a thing without its price. Although with a strong motor, presumably to exploit the slicing/ shredding discs to the fullest, the motor base of Hamilton Beach 70740 is not constructed with high tier materials or with a robust frame. This leads to a handful of complaints on the instance where the machine is unexpectedly loud during certain processes. However, to be honest, for a medium size (8-cup) this cheap, this is as good as it gets, and it’s one of the best inexpensive, under $100 food processors right now. As mentioned before, food processors are prone to overheating if forced to work extensively. If that happens, Hamilton Beach advises leaving the machine to rest for 4 minutes, even mid-session if the workload ahead is too large. The Hamilton Beach 70740 is covered with a 1-year Limited warranty. Hamilton Beach 70740 is a considerably inexpensive machine yet not without acceptable functions. The machine can finish certain tasks without difficulty, that’s true. However, examining it through a tighter scope, its focus is more on quantity (in a way), not quality, and that may backfire in the long run. Regardless, if your kitchen demands solely involve occasional uses, and you want a food processor just in case, this should be a perfect pick. If you’ve set your target on a machine that doesn’t take up much space on your counter and can assist you with daily, normal food prep tasks then you might be interested in the DLC-2ABC from Cuisinart. Even though first introduced more than a decade ago, the model is still the best small food processor in the eyes of many. With straightforward designs and sturdy builds, while maintaining itself in a compact frame, plus multiple color options for furnishing purpose, it has everything a home cook wants in a mini chopper. The DLC-2ABC is designed with touchpads, promising smooth control. With little pressure needed on the pads for activation, oil from our fingertips is less likely to be imprinted, and if there were any, it would easy to clean off. The unit has two operating modes, controlled by the two buttons: chopping/mixing mode for soft ingredients like tomatoes, garlic, etc. and grinding mode for harder texture ones such as nuts or dried fruits. Mini food processors have small work bowls, that’s why some prefer to call them cups (because… they look like cups.) Almost all work cups have no feed tubes. Such is also the case here. However, the DLC-2ABC instead features two small drip holes on the lid for any liquid to drizzle through while incorporating, let’s say, a salad dressing. But that’s not all it’s got to offer. Food processors of this kind from Cuisinart are also built with a safety feature. We can get the unit to operate only and only when the lid is securely locked into place. That way if we have our hands or the spatula in the cup and someone accidentally presses on the pads, the blade won’t spin. The DLC-2ABC comes with auto-reversing SmartPower ® S blade with sharp edges for chopping and blunt ones on the other side of the blade for grinding tasks. Both actions can be done without removing the blade. When pressed upon, the slicing pad spins the blade in one direction using the sharp edges to cut or mix up ingredients. Meanwhile, the blade will spin in the opposite direction to grind with the blunt edges when the grinding mode is activated. It is worth noting that even though advertised to be versatile, the machine is not really up to grind. Aside from that, it is still a great little helper. As mentioned before, the DLC-2ABC model is designed not with complexity but with simplicity, aiming to be as user-friendly as possible. The whole set includes one motor, one S blade, and one work cup and lid. The lid and the work cup lock/unlock with only one simple twist, and the blade can be removed by lifting it up. Safety tips: 1) never put the blade on the motor base without work bowl properly in place. 2) made sure the blade has stopped spinning before opening the lid. Cleaning these parts will be effortless as all of them are dishwasher safe. It’s suggested to put the work bowl, lid, blade assembly and spatula on the top rack. If there isn’t a dishwasher present, cleaning should not be troublesome either. There are just one bowl and one lid. Rinse them after use and wash them with warm soapy water. The motor base is merely a few soaked wipes away from being shiny as well. The only thing that you should watch out for is the blades. As they are EXTREMELY sharp and somewhat small, you could easily get injured trying to look for them under the bubbles. So try to rinse and clean them first, and always be CAREFUL. Notice: Always be careful handling the blades in food processors. They are EXTREMELY sharp. Compared to other mini choppers, the Cuisinart DLC-2ABC is equipped with a somewhat strong motor. Slicing and grinding at 250 W, or approximately ⅓ HP, the unit can handle almost any kind of ingredients you can think of. The productivity of this machine, as is that of other processors, depends on the texture and load of ingredients that users want to chop/mix. So be careful with forcing your “friend” to overwork. It is recommended by Cuisinart to never run the Mini-Prep Plus model DLC-2ABC more than 1 minute continuously and to let it rest/ cool down once in a while if the anticipated work seems to be substantial. A 18 month Limited warranty covers every mini food chopper from Cuisinart. The Cuisinart Mini-Prep Plus model DLC-2ABC is a balanced little machine. A quality case, a decent motor and variety of color choices, one will get their money’s worth out of this model. However, judging the machine from all angles, we can’t leave out the little setback that its grinding ability is not as good as advertised, though still okay. Apart from that, at the price of only (approx) $30, it’s no doubt a good bargain. Maybe that’s why it’s still standing among the top 5 best sellers for such a long while. Where were we? Economical decisions? Of course we were. I don’t even care what we’ve been discussing, because somehow us thoughtful consumers always end up talking about products of “low budget and high quality”, even though such products don’t even exist. But we can’t be blamed for trying, can we? So we might as well go right ahead and look for “the dreamiest purchase”. One potential candidate of that title is the Ninja Master Prep QB1004. The QB1004 is a combination of chopper, blender and food processor accompanied by a Ninja signature designed, the Master Pod motor. You can already tell the versatility of the whole set is fantastic. Shall we read deeper into the details and see what a “ninja” can do? For those of you who have been familiar with the design of Ninja food processors, there’s nothing more you need to know. For those of you who have not, there’s… not much to tell you either. The company has designed the motor base (in this case, the motor pod or Master pod) so even a tech-noob can use the unit without any difficulties whatsoever. The Master pod features only one big pulse pad in the middle of the pod. No speed options, no instructions. And yet none has complained about how they could not figure out the way it activates. Simple, but smart. Regarding velocity, although some might think it’s inconvenient not having multiple speeds, it’s actually pretty clever, the way they did, to effectively maximize the limited space on a motor case of such style. By placing only one large pad in the middle, the design lets users stabilize the unit and at the same time activate it in one holding-it-down action. Okay here comes the good part. One of the main reasons consumer choose this particular model is its set of 3 containers. The set consists of 1 large pitcher for blending, 1 medium pitcher for general food processing and 1 mini chopper work bowl. Owning the Ninja Master Prep QB1004, you basically don’t need any other countertop “assistants”. Unless you’re planning on multi-task with 3 different machines every single day, the Ninja QB1004 can act as a blender, a food processor or a mini chopper separately just as fine. In details, the biggest pitcher is 6 cups, the medium is 5 cups and the mini bowl is 2 cups. Coming along with the containers are 3 splash guards to completely seal the pitchers and work bowl during sessions, and 3 storage lids to keep the final mixture unexposed. Ninja’s approach to crushing/ chopping is not the same as your typical company. Instead of putting a stronger motor in their Master Pod, Ninja went and developed their blades and introduced the Ninja ® stacked blade technology. the Ninja Master Prep QB1004 offers 3 stacked blade assemblies exclusive for each container. The 6-blade is specifically framed to crush ice to snow in seconds and the 4-blade is meant for less time spent on chopping, mixing or pureeing. It’s the same story with the 4 blade assembly. In normal mini choppers or medium size processors, the blade assembly is usually with 2 blades, working the bottom half of the bowl. Now Ninja adds two more on top to cover the entire interior space. Doubled the blades, doubled the pace. To assemble to quadrupled blades, hole the lower half by its shaft and place it over the spindle. Then insert the upper half and rotate it until it locks. Assembling/ disassembling of the Ninja Master Prep Pro System QB1004 is surprisingly simple, considering the fact that the set has quite a few pieces. It’s because even though there are three containers, they all follow the same mechanics. First the container, then the blades, and then the Master pod on top. That pretty much sets it up. The pod docks on the hub of the blades without any locking whatsoever. Just put it on the right place and you’re good to go, no turning or twisting required. NEVER connect the pod with the blade assemblies WITHOUT them being inside the bowl and with splash guard on. Safety tips: the blade assemblies are not fixed and removable, so always remove the blades or hold down the shaft before pouring. Okay, on to cleaning. For the folks with a dishwashing machine, you’ll be glad to hear that all the parts, except for the pod, are dishwasher safe. It’s recommended from the manufacturer that the lids, splash guards and blade assemblies be placed on the top rack. Folks without a dishwasher should not be too worried either. Handful as it seems, the set is not complicatedly constructed. The two pitchers and the work bowl should be familiar to you so no problem there; splash guards are not difficult to deal with, though be gentle not to tear them or poke holes on them. The blades, again, are our main worry. Being careful while they are in the sink with soapy bubbles, holding them by the shaft and patiently cleaning them should lower the chance of accidental laceration. Not like your typical motor base, Ninja houses their “engine” in a top-down Master pod, designed with a peculiar yet clever push. To simplify both actions needed to effectively operate a processor — motor engaging and stabilizing — is to exploit designing work to the fullest. The motor of the Ninja Master Prep Pro System QB1004 is also a decent one in spite of the set’s low cost. At 450 W (~⅔ HP) plus the exclusive multi-blade technology, there’s close to nothing that the machine can’t chop and crush into mulch. Like any other machines for home use, it is often advised not to overload the pitcher or work bowl. Doing so eventually results in straining the motor and causes it to overheat quickly. It’s also in the manual guide that the appliance should not be operated continuously for more than 15 seconds. Otherwise, the thermal switch will likely shut the motor down. To reset, unplug the Master pod and let it cool for 10 minutes before reuse. Ninja Master Prep Pro System QB1004 is covered with a limited 1-year warranty. At the cost of under $40, the Ninja Master Prep Pro System QB1004 seems too good to be real. Offering versatility rarely seen in a single purchase, the set is currently one of the most favorable products on several online retailers. The only drawback is you can’t add ingredients mid processing, which could be a fatal blow from a food processor standpoint. To be frank, they are truly more of a budget blender set. Let’s remember one thing: not all home cooks are amateur cooks; not all of them cook because of obligation but rather of satisfaction. They want versatility, speed and precision, expecting more from a kitchen tool regardless of market value. They are cooks with a reasonable amount of knowledge and experience to know exactly what they are looking for in a food processor. They are cooks that have been unsatisfied with the average, that have been looking for improvements. Those are the targets that Breville aims to please with the BFP800XL Sous Chef Food Processor. A machine that, at the time of this writing, is the number one favorite of high-end processors on Amazon. Why is that? We shall dig into it right now. In the picture above, we can see there are three buttons in total and a little LCD display on the motor base. First, the buttons. If you were expecting those to be multiple speed settings, you could not be more disappointed. As you go to higher tiers of these machines, you’ll realize that multiple speeds are not seen as useful as pulsing to many manufacturers. Fact is only low-end brands adopt varied speed options to their machines. Whether it’s a marketing move is a matter for the judge. But I digress. The three buttons include Power/ OFF, Start/ Pause and Pulse. They are pretty self-explanatory. To operate the machine, first, you need to turn it on with the Power/ OFF button, then keeping it running continuously with the Start/ Pause or pulsing is up to you. When the Power button is pressed, the Power light will show red and the other two buttons will show blue. If Start is pressed, Power red light will flash. If pressed again to pause, Start blue light will flash instead of the red. If the large pusher, or lid, is unlocked, the machine will pause automatically as you will see the Start blue light flashing. Second is one of the handiest function, besides the safety interlock: the timer. The LCD display mentioned earlier is actually a time indicator. Here’s how it works: the timer starts counting up when the Start button is pressed and stops when the machine is paused or OFF is pressed, keeping track of the taken time of each session. We can also set a timer and leave the machine run for itself. To the left of the display are Up and Down buttons. Press the buttons to set the duration we want, then press Start and the motor will operate until the time reaches 0 or if you Pause or turn it off. It will also sound three beeps to let us know when the time runs out. The timer will become really valuable when there are too many things to handle around the kitchen. The Breville BFP800XL Sous Chef Food Processor offers a 16 cup primary work bowl and a 2.5 cup secondary mini bowl which will come in handy when only a small volume of ingredient needs to be processed. Docking of the lid and the work bowl itself is no different from the traditional turn-to-lock mechanics that has been widely applied over the years. There’s no reason not to follow a well-aged, effective method. The work bowl is also the key to the unit’s interlock safety features. The mechanism works the same way as that of the Cuisinart Custom ™ 14 Cup. Activation of the motor will only be feasible when and only when the work bowl, the lid, and the large pusher are securely in place. If one of those components is not, the motor will be temporarily deactivated to reduce risks of accident. One more thing: To use the mini work bowl, we have to put it inside the large work bowl (and use the small S blade) because the safety feature requires the large bowl and lid in place. As opposed to mid-priced models, BFP800XL Sous Chef Food Processor provides not only the standard slicing, shredding discs and S blade, but also a storage box with additional discs and blades. Let’s talk discs first. In the package, there will be a total of five pieces. An adjustable slicing disc, a double-sided shredding disc, a julienne disc, a French fry cutting disc, and a whisking disc. The adjustable slicing disc has a knob at its hub. The knob allows users to modify the angle of the blade to produce desirable slice thickness, up to 8.0 mm. At 0, the blade lies flat on the same level of the whole disc, leaving almost zero chances to unwanted injuries. Customers have two shredding size options as well since the disc is designed to be functional on both sides. There are also a julienne disc and a French fry cutting disc to meet a required cut texture for a dish, and a whisking disc for cream. In short, there’s not much you cannot do with the Breville Sous Chef™ 16 Pro. In terms of blades, things are relatively standard, except for the micro-serrated universal S blade, which promises outstanding precision in chopping. In the blade set, with the two blade assemblies — the universal, stainless steel S blade for the 16 cups and a smaller one for the 2.5 cups, is a plastic S blade for the need of dough kneading. The plastic S blade is a lot safer compared to the metal blade for the said process as the blades usually stick to the dough and it’s hard to separate them without some force, which could easily be risky. Another nice thing about BFP800XL Sous Chef Food Processor is the storage box. The box itself is fairly compact. Still, everything single blades and discs can sit inside neatly. It’s one clever addition to the package and a true space saver. The product is constructed with a similar structure to most large processors out on the market. The main operating parts include a motor base, a work bowl, blade or discs and a lid with feed chute. We’ve talked about the docking of the work bowl and lid. As for the discs and blades, the mechanics also follows the common universal design to save any user the time of familiarizing themselves with strange setups. The blades can be placed in or removed by simply putting them over the drive hub or lifting them up. The discs are basically the same with an extra part. First, we need the spindle, then the discs on top of it and we’re done. All the parts, excluding the motor base, are dishwasher safe (top shelf). To clean the motor, a damp and a dry piece of cloth would suffice. Even though the plastic parts are dishwasher safe, Breville suggests minding and toning down the water temperature. Long exposure to hot water and harsh detergent will damage and affect the life of the plastic. If you are without a dishwashing machine, Breville adds a cleaning brush with one end for brushing and the other end for scraping. Warm water and soap are recommended to better clean the parts. However, in time of cleaning the blades and discs, extra caution is advised. They, as all food processor blades and discs, are EXTREMELY sharp. NEVER leave them under sudsy water where you cannot fully have visuals of them to avoid blood shedding. The motor of the Breville Sous Chef™ 16 Pro is a strong induction motor. At 1200 W, you can imagine the work can be done by this baby in association with the 16 cup bowl. It is suggested to turn the machine off with the Power button, remove the power cord and let the unit cool for about 30 minutes. In the scenario of processing stiff mixture like dough, the blade may seem to slow down quite a bit. If this happens, stop processing just prior to 1 minute passed to prevent overloading. There’s also a possibility of jamming. If such an incident occurs, ALWAYS make sure that the Power button is off and the cord is out of the power source before proceeding to unwedge the compound inside. If the same thing happens again right after, try letting the motor rest and working smaller batches. IMPORTANT NOTE: the Breville Sous Chef™ 16 Pro is designed to not operate without the work bowl, lid and large pusher out of place. In the event that the motor runs without listed criterion, IMMEDIATELY disconnect the power and contact Breville Consumer Support. The Breville Sous Chef™ 16 Pro BFP800XL is doubtlessly an expensive piece of appliance. Still, judging by its popularity and its positive reviewed functionality, I think it safe to say that this (almost) $400 would be a productive investment.